Welcome to the April 2015 Mystery Chocolate Box! By this time, you have most likely had a chance to try all of these bars, so let’s take a look at what they were! One thing before we get started with April’s bars: if you haven’t heard about our new Cacao Points program yet, click here (it involves free chocolate). I like to think of this bar as “mysteriously delicious”. It has very subtle flavor tones that contrast against the super crunchy cacao nibs (we hope you guessed that one right!). They’ve done magic to make a dark chocolate bar taste pretty sweet (I think some of that magic comes from the flavors in the bar…). People tended to have a harder time guessing the flavors in this bar because they’re not very strong flavors. Cinnamon, vanilla, and cacao nibs were the flavors in this bar. If you didn’t guess the nibs correctly, well, you might need a taste bud tune up. However, the cinnamon and vanilla were very subtle, so if you guesses those correctly, congrats! You have some fantastic senses! Fruition handcrafts their chocolate bars from bean to bar in Shokan, NY (that’s a small town in the mountains about 90 miles north of NYC. Yes, we had to look it up). They use fair trade, organic chocolate and all that jazz, so you can feel good about their chocolate. The first time I tried this bar, I didn’t know what to expect. I had never had a chocolate bar with this specific fruit in it, so I was really excited to taste it. When I first bit into this bar, I noticed a very fruity flavor flowing in, mixing perfectly with the chocolate and adding a layer of sweetness… a perfect combination. Occasionally, I noticed a crunch which served as a subtle hint to the fruit that’s inside. Overall, I was very pleased with this bar, and I hope you were too! Yes, blackberry! Were you surprised? An unusual fruit to be put inside of a chocolate bar, but after tasting it, we’re wondering why more people don’t use blackberries with chocolate. Hailing from Colombia, Chocolate Santander is the only chocolate company that makes chocolate bars from cacao beans solely sourced in their home country. Their chocolate farmers use traditional Colombian growing and farming techniques to deliver amazing tasting chocolate. Imagine your taste buds surfing on a wave of smooth, milky chocolate, riding the flow of the current as it melts in your mouth. Then, the wave crashes on a soft, pleasant crunch. The substance of the crunch draws you away from the current of the chocolate, capturing your attention for a moment, then sending you back into the milk chocolatey stream of bliss as you finish off the bite. That’s Bar C in a nutshell… so what was it? Very interesting combination, right? This is a very sweet, milky “dessert” chocolate bar — that is, it’s so sweet you would only have it after a meal. (Some dark chocolate bars, as we’ve discussed before, can actually be had as a snack between meals). 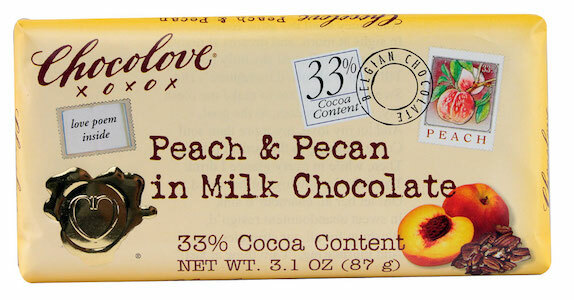 About Chocolove: well, you should have heard of them before because we featured them in our August 2014 box. Basically, they treat chocolate as a love letter to your heart…not just your stomach. So they also include a love letter on the inside of the wrapper. Fun stuff! how did you like this box? We’d love to hear your thoughts on each of these bars…or anything else!